Lucia, a celebration of light… as the holiday season 2011/2012 approaches. You are invited to join us for a truly enchanting experience Dec 2 2011 when the almost 250-year old tradition of the ‘queen of light’, Lucia, is celebrated at the Royal York Fairmont Hotel in Toronto. This is the perfect event to invite your business acquaintances, friends and family to join in the heartfelt, atmospheric afternoon filled with good food, fun filled raffle as well as time to pause and reflect, away from daily routines. This is the time to spend with old friends and the time to make some new friends. Warm yourself with a traditional glass of glögg (spicy mulled wine) lussie katter (saffron buns) and peppearkakor (ginger snaps) . 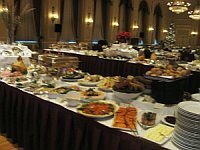 Then continue into the Concert Hall for the Lucia luncheon – You will enjoy the beloved ‘Julbord’,… the traditional Swedish Christmas buffet. Enjoy the best of everything Swedish with an endless array of delicacies including pickled herring, gravlax, paté, knäckebröd, Swedish styled glazed ham, meatballs with beetroot salad, Jansons frestelse, oven roasted ribs, smoked eel, golden roe caviar…, Chef’s paté, tasty cheeses and also to mention all the , mouthwatering desserts and much, much more… Of course, the “Julbord” would not be complete without the traditional Aquavit to put you into the singing spirit! Savor your luncheon in the presence of Santa Lucia and her maids as they sing traditional Lucia carols, conveying the true Holiday feeling. Witness the charm of the children singing Lucia’s beautiful melodies. Just magical! The Lucia Luncheon continues until all the prizes have been given out in the very popular Lucia raffle!